Introduction: Here at TT HQ, we were quite uncertain as to whether or not we’d see Spring let alone the warm inviting days of Summer, but the weather has finally seemed to turn a corner. We thought, what better way to celebrate this occasion than to invite Ms. Casey, and new TT Girl, Jess into the lab and show off some of the exciting tackle we’ve been using enroute to giving your our recommendations on what’s hot for the Summer. Ms. Casey stops by to help us with our 2011 Summer Buyer's Guide. Freshwater Casting Reel: When some Anglers first see the Speed Spool baitcasters from Lew's they wonder where the brand came from. Well, Lew's has been here as long as baitcasters themselves and the company is looking to introduce a whole new generation of anglers to the brand with quality offerings like the Tournament Pro Speed Spool baitcaster. This reel received our "Best Value" Award back in May and continues to be a great reel for the money delivering in terms of both performance and value. Retailing for $199 dollars this exciting new reel is a great choice for anglers looking for a compact baitcaster loaded with plenty of features including a carbon fiber hand and a externally adjustable dual cast control system. The complete range of new Lew's baitcasting reels are now available now at Tackle Warehouse. Freshwater Spinning Reel: Magnesium based spinning reels may still be the most refined but the sheer cost of the material and manufacturing makes Mg based reels simply too expensive an investment for some anglers. Shimano's Stradic CI4 delivers the weight reduction many anglers desire in a finesse reel yet it is not as prone to corrosion because the frame and rotor are made out of carbon versus magnesium. This "carbon infusion" material is more rigid and nearly twice as strong as traditional graphite. This year Shimano introduced a wide range of sizes and best of all the Stradic C14 continues to be very reasonably priced at only $199.99-$219.99. All the reels are now available at Tackle Warehouse. Freshwater Casting Rod : G.Loomis NRX 852C JWR. Freshwater Casting Rod: When G.Loomis debuted their production model NRX rods they took home ICAST's "Best of Show" Award but anglers were unsure just what to think of these new costly rods which sported new designs that were atypical from traditional Loomis offerings. We finally got our hands on a few of these sticks in late March and at the risk of spoiling our future pending reviews on several different models, we can tell you these sticks are the real deal. One of our current favorites? A model that skirts both our 2010 Search For One campaign and our finesse themed 2011, the NRX 852C JWR. While the first NRX review is right around the corner the entire G.Loomis NRX lineup is available now at Tackle Warehouse. Freshwater Spinning Rod : St Croix's LTBS66MLF Split Shot Special. Freshwater Spinning Rod: Considering our focus on finesse tackle this year, you can imagine that we’ve seen our fair share of spinning rods. It’s a foregone conclusion we’ll be fishing these sticks through 2011 and into 2012 and while each of us values different characteristics in a spinning stick, one thing is for sure, St. Croix’s Legend Tournament Series will always be a TT favorite. Their combination of utility, component choices, craftsmanship, and of course, color scheme are all reassuring reasons as to why we know we won’t be disappointed each time we pick one of these sticks up. Our Summer Gift Guide recommendation? The Legend Tournament LTBS66MLF Split Shot Special. The Legend Tournament is available at Hi's Tackle Box now. 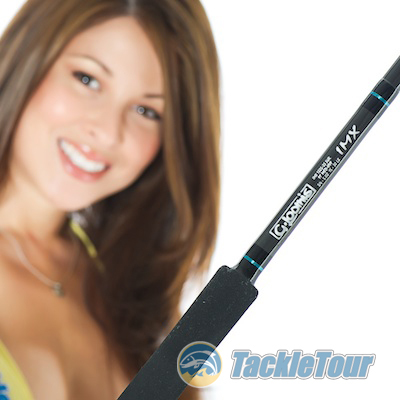 Saltwater Rod : G.Loomis IMX Surf. Saltwater Rod: When giving thought to saltwater angling, most of us think of long days on a rocky boat battling the urge to, well, you get the idea. But in recent years, at least along the San Francisco coastline, there’s been a resurgence of surf fishing. Whether that be for perch or the coveted striped bass, gear for surf fishing has been long overlooked and really, taken for granted. But not by the folks over at G.Loomis, their IMX Surf Rods are a hot commodity and easily our pick for Summer surf fishing fun along the coast. Ready to make a cast? The IMX Surf rod is available now at Hi's Tackle Box.